So when the trained palate isn't out with the pudgy gal, and it's twelve hours later than a Noontime Travel, just what is it? Well, it's a Midnight Travel, and the trained palate is usually accompanied by the trained artist in their search for food after 10pm. 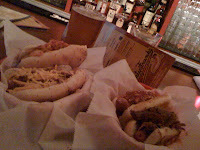 "I am at dirty franks and they have a kimchee dog. OMG they also have a siracha dog and indian mango chutney dog. we are coming here all the time asap"
"You went to Dirty Frank's WITHOUT ME? I've been trying to get you to go for like two weeks!!" "Oh man, that chicago dog was so good! You're gonna love it..."
"It's okay, we'll go tomorrow"
For those of you who don't know, Dirty Frank's Hot Dog Palace is the latest addition to Liz Lessner's family of bar/eateries. Betty's, Surly Girl, and Tip Top are the others, all have food until 1 or 2 am, a great selection of beers and mixed drinks and a healthy dose of humor. Fast forward to tonight.. FINALLY! I got the Seoul (kimchee) dog and the Chili dog, while the trained artist got the Whoa Nelly (BBQ brisket on a hotdog) and the Hot Bollywood (spicy Indian mango chutney) And of course a couple of beers and tater tots to round everything out. We later got the Ohioana (sweet corn, red pepper, jalapeno, and red onion relish topped with celery salt) to split. I will say I think certain combinations of topping would be better suited for the polish sausage or the jumbo beef dog. The kimchee isn't bad for not being homemade, but it's almost overpowering with just the standard hot dog. The advertized sharp cheddar is nice and sharp, the Whoa Nelly is SUPER beefy and the Bollywood is hot, but a bit messy. Needless to say, the artist wants to work his way through the dog menu and I'm happy to tag along. Lines OUT the door at noon yesterday! And if you haven't checked out the sweet potato fries at the Tip Top .... Oh my! I'm not surprsed, the food is fast but the whole place is the size of my apartment! And yes, I know Tip Top QUITE well. The eggplant fries are my favorite there as well as the Cowbell. I saw that! 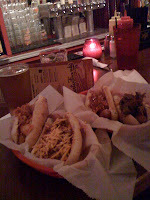 They had a kimchee dog as well..
Flo's special sounds a lot like a Chicago dog, another personal favorite of mine. 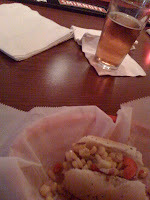 When we fly to Korea, it is through O'Hare so my last meal on U.S. soil is usually a Gold Coast chargrilled Chicago dog. "No Mary Ellen, it's not cookies."